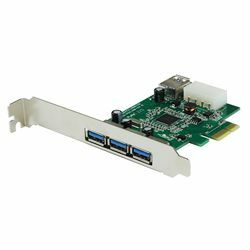 Add four USB 3.0 data ports to your computer with this PCI-e expansion card. Fully compatible with PCI-e v2.0, it provides upwards of 5Gbps in data transfer speeds. A 4-pin Molex socket allows you to supplement the PCI-e power to provide additional amperage to your connected USB devices. It puts three ports on the back of your case and one inside for internal peripherals like drive bay card readers or hubs. Includes optional low-profile bracket and software on CD-ROM. Requires PCI-e slot and Microsoft Windows 2000+.